Use this sofa to update your transitional style living room. This sofa has tuxedo arms, three box seat cushions and loose back cushions. The Atlanta Transitional Sleeper Sofa w/ Dreamquest Mattress by Trisha Yearwood Home Collection by Klaussner at Furniture Barn in the Pennsville, Bear, Newark, Hockessin, Middletown, New Castle, Townsend, Talleyville, Wilmington, Marshallton, Smyrna, Elkton, area. Product availability may vary. Contact us for the most current availability on this product. Arm Tuxedo arms create transitional look. Seat Three box seat cushions. The Atlanta collection is a great option if you are looking for Transitional furniture in the Pennsville, Bear, Newark, Hockessin, Middletown, New Castle, Townsend, Talleyville, Wilmington, Marshallton, Smyrna, Elkton, area. 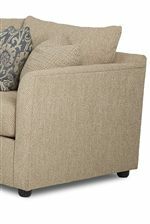 Browse other items in the Atlanta collection from Furniture Barn in the Pennsville, Bear, Newark, Hockessin, Middletown, New Castle, Townsend, Talleyville, Wilmington, Marshallton, Smyrna, Elkton, area.